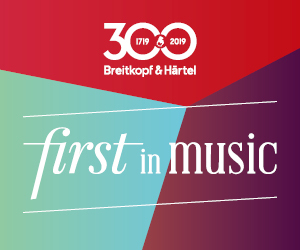 This year marks the 300th anniversary of the world's oldest music publishing house, Breitkopf & Härtel. 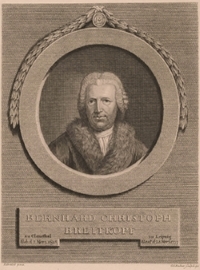 Founded by Bernhard Christoph Breitkopf in 1719 in Leipzig, Breitkopf & Härtel is known for its scholarly editions of composers including J.S. Bach, Mozart, Schumann, Mendelssohn, and Brahms. They also publish the works of more recent composers such as Max Reger, Ferruccio Busoni, Miklós Rózsa, and Helmut Lachenmann. Their catalogue includes complete editions by Mendelssohn, Eisler and Sibelius, a variety of chamber and solo music as well as contemporary music and teaching aids. ‘Breitkopf Urtext’ editions are prepared by leading specialists and always contain a critical commentary. With great pride and much gratitude, Breitkopf & Härtel can look back on a corporate history unique in music life, starting from a small Leipzig printing shop to having one of the largest music-publishing programs available, Breitkopf & Härtel was then and is today “first in music”. Watch this video for a brief history celebrating the 300th anniversary of the company. Breitkopf & Härtel began as a publisher of general books in 1719 after the wedding of Bernhard Christoph Breitkopf and Maria Sophia Müller. The Müller family print shop, a business establishment dating back to 1542, was passed down through this marriage which was the start of Breitkopf's publishing venture. Their first musical publication was Schmelli's Gesangbuch, published in 1736. By 1754 they began to specialise in printed music publishing, after Johann Gottlob Immanuel Breitkopf invented groundbreaking music-print technology. Breitkopf’s invention triggered an unprecedented production of printed music. This soon attracted prominent German composers to the publishing house including Telemann, Quantz, Hasse, Leopold Mozart, Haydn, Dittersdorf, Stamitz, as well as many others. 'Härtel' was added to the name when Gottfried Christoph Härtel (1763-1827) took over the company in 1795. From the very beginning, Härtel published highly significant works; among them was Handel’s Messiah, J .S. Bach’s “Ein Feste Burg ist Unser Gott,” and 25 of Beethoven's first editions. They were the first to publish operas by Auber, Bellini, Cherubini, Donizetti, Marschner, Meyerbeer, and Mehul. 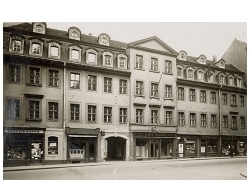 The Goldener Baer publishing premises were acquired in 1732. It was sadly destroyed in a World War II bombing raid in December 1943. Many important archive materials and autographs were being held here at the time of the bombing. Salvaged works were split between Darmstadt, the Leipzig State Archives, and Berlin. Following 1945, the company was divided into two, one half housed in East Germany and the other in the West. In 1991, the separate companies reunited once more. Around 130 years ago, Gustav Mahler started his career in Leipzig as one of the most important conductors of his time and as one of the greatest symphonists ever. At the same time, Breitkopf & Härtel began to build up its score and orchestra library. Despite Mahler’s efforts to have his works published by Breitkopf & Härtel, a co-operation did not come into being at this time. They are now pleased to announce one of their most ambitious projects in the year of their 300th anniversary: the publication of all Gustav Mahler’s symphonies. Available to purchase now is Mahler's Symphony No. 1 in D major, as well as the Symphonic Movement "Blumine" to the 1st Symphony. The “Blumine” movement included in the original five-movement version of Mahler’s Symphony No. 1 was long considered lost. Composed as early as 1884 for a theater piece, Mahler inserted it into the symphony as its second movement in 1888. After three performances, he turned his back on this “Love Episode,” calling the “sentimental, gushing movement” a “youthful folly,” and removed it. The critical new edition is based for the first time on the autograph score, together with the rediscovered score copy with Mahler’s last revisions. Another exciting publication from Breitkopf & Härtel is Georg Frederich Handel's Messiah (1741 HWV 56) edited by Malcolm Bruno and Caroline Ritchie. The focus of this new edition is the Messiah as first conceived by the composer in 1741: before its first performance in Dublin in 1742, before the first London performances of the mid 1740s, and before the final Foundling Hospital performances in the late 1750s. The editor succeeds in creating a 21st-century edition from the perspective of 1741, making clear that Messiah was a genius hit from the start. Included in this edition is thorough information on Händel's performance practice in 1741 (including topics such as orchestration, continuo, text underlay and specific questions on interpretation), a reconstruction of the wind parts according to contemporary sources, and a piano vocal score with contemporary vocal ornamentation. This is the first edition to include the German text by Herder which is content-wise and phonetically closer to Jennens’ text than any other translation, therefore being a perfect singable alternative. The appendix contains additionally the most popular and important aria versions composed after 1741 for practical reasons. Handel: Messiah 1741 HWV56 Vocal Score edited by Malcolm Bruno. The Breitkopf Originals series opens up a fascinating view into the Breitkopf & Härtel publishing-house archives. The focus is on its rarities and treasures, together with milestones in the history of interpretation for works of the Classical and Romantic repertoire, presented by the most prominent artists of their time. Featuring the original Breitkopf & Härtel cover designs. The newest addition to Breitkopf & Härtel's OperAria series.